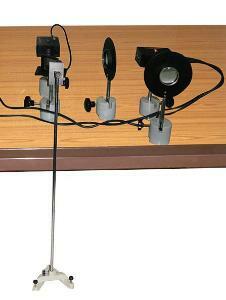 A classical experiment to determine the speed of light in air. The LASER beam from the Transmitter strikes the Beam Splitter to split the beam in two perpendicular directions. 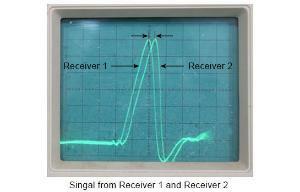 The first beam is transmitted through Transmitter directly and is received in first channel of the receiver. The second perpendicular beam from Beam Splitter travels a larger distance by being reflected back from a mirror placed about 5 meter or more and is received in second channel of the receiver. In the present setup, the time difference between the two peaks of received LASER signals can be observed on a oscilloscope (40MHz) and can be used to calculate the Speed of Light. Ordering information: Includes Laser Transmitter Module, Laser Receiver Module, Power Adaptor 5V, Beam Splitter, Convex Lens f=50mm, Cylindrical Base, Reflecting Mirror in Mount, 'A' Base, Support Rod (1m), BNC to BNC Cable. Required but not included: Oscilloscope 40 MHz.